HighTech Finishing recently attended and displayed at the 2018 EBACE European Business Aviation Convention in Geneva, Switzerland. HTF showed its current product offerings as well as introduced new decorative finishes aimed exclusively for the aviation market. 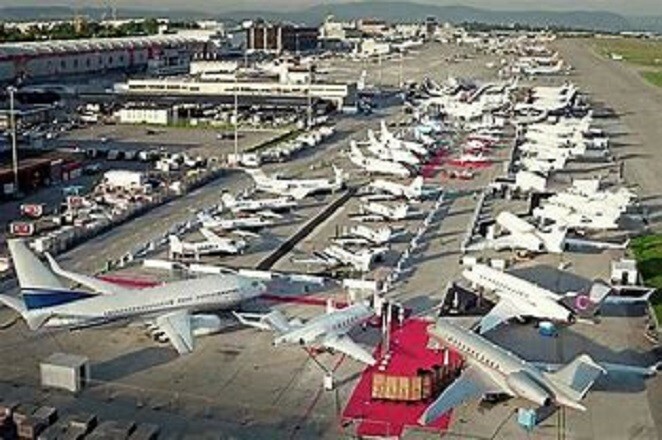 EBACE is the premier trade show focusing on the European and Middle Eastern aircraft operations. The show brings together thousands of key personnel from a wide spectrum of aviation manufacturers and suppliers, from all over the globe. It’s a key show for HighTechs’ international buyers and sellers to get together in one place. For our purposes, we connect with designers and purchasers seeking a unique look, shorter lead times, or high-quality product for their own customer. Being at the show and displaying a variety of samples allows us to meet with prospective and current customers as well as build relationships with a wide variety of suppliers. Visitors to our booth were attracted to the beautiful variety of finishes to select from and also see, first-hand, the exceptional level of detail and quality that goes into our plating process. We’re Ready to Work With You! One of the best parts of attending this aviation trade show is establishing dialogue with attendees. This allows us to work together to decide the best course of action to satisfy their needs and their end customer, the aircraft owner. Those relationships are special to our business. Because HighTech Finishing has attended the EBACE conference since 2002, it is rewarding to be able to connect with a wide range of familiar customers and suppliers each year. We would appreciate the opportunity to connect with you. Ready to get started on your next HighTech Finishing order? Contact Us today by phone at 800-949-0124 or complete our Contact Form to take advantage of our elevated brilliance delivering the highest-quality products to our customers.